Identity theft and business fraud are on the rise. Do you have a secure, reliable and efficient document destruction solution? 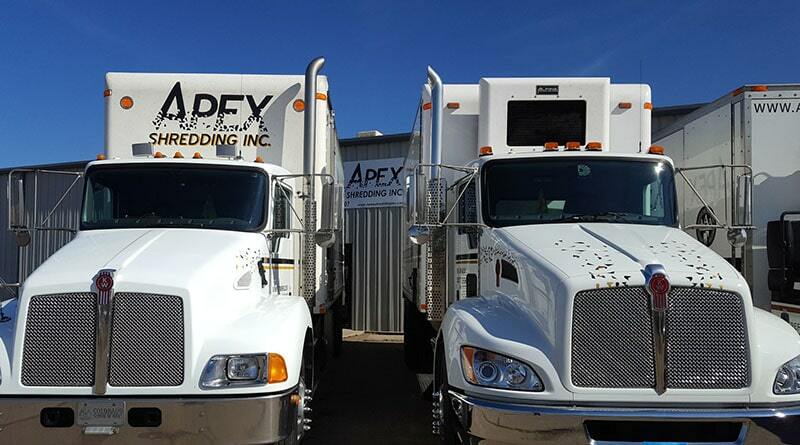 Apex Shredding's onsite mobile shredding services eliminate time-consuming and risk-prone in-house shredding processes. With our scheduled shredding service we deliver locked shredding collection containers to your office, allowing your staff to conveniently discard confidential files and documents quickly and securely. Executive Office Consoles - These furniture-like collection containers allow employees to drop their documents through a narrow receiving slot along the upper face. These consoles hold a capacity of approximately 100lbs of loose documents. 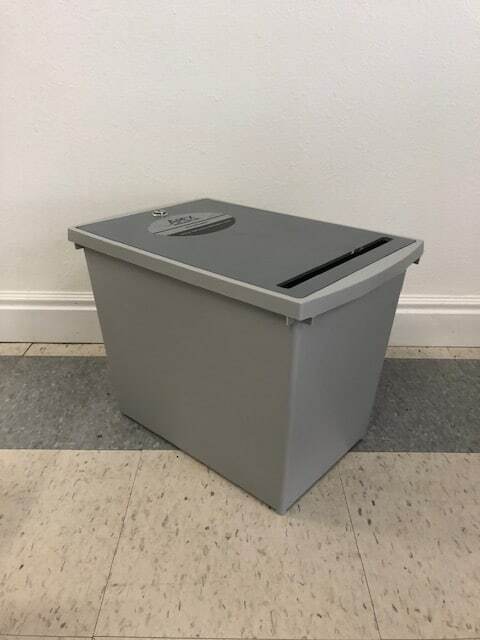 Dimensions: H 34 3/4" • W 19 1/4" • D 17"
Under-Desk Compact - This small, portable container is ideal for individual office use as it fits perfectly underneath or against any desk and can hold a capacity of approximately 30lbs. The sturdy lid makes tampering nearly impossible, yet it is easy to unlock and empty when full. 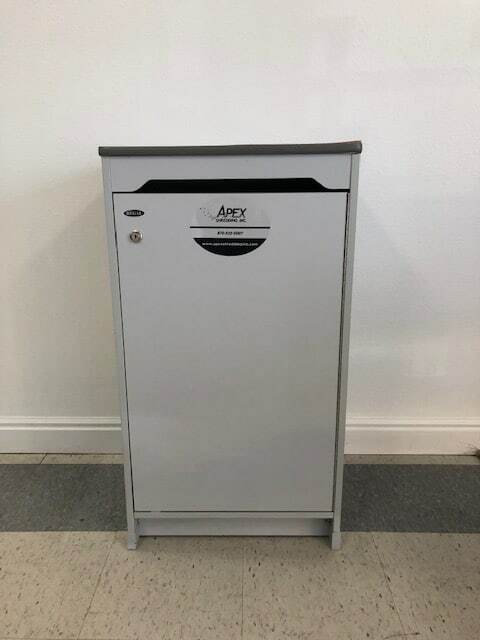 Dimensions: H 13 1/4 • W 12" • D 17 3/4"
The 64 or 96 Gallon Cart allows employees to discard their documents through a narrow opening on the lid of the container. 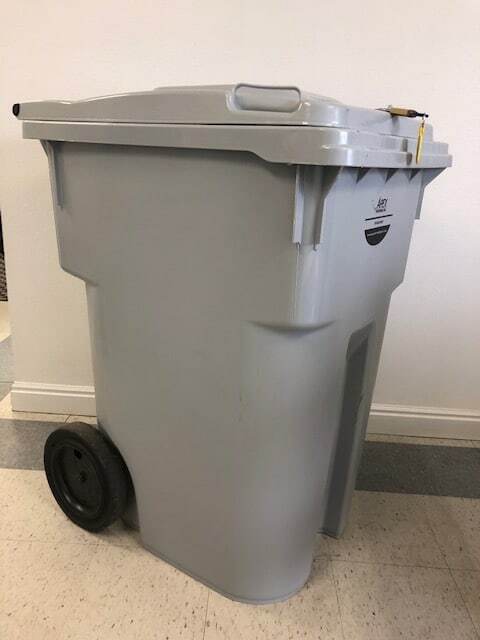 The 64 Gallon Cart can hold up to 200lbs of loose documents and is secured with a built-in lock, while the 96 Gallon Cart can hold up to 300lbs and is secured with a padlock. 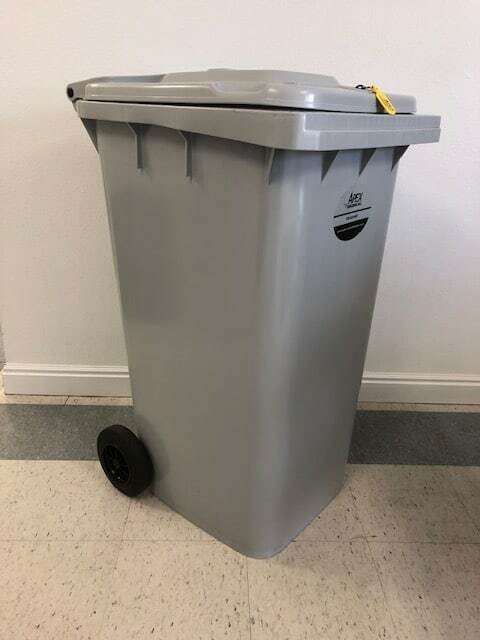 64-Gallon Dimensions: H 41" • W 23" • D 29"
96-Gallon Dimensions: H 43 1/2" • W 25" • D 35"
All collection containers remain locked and can only be accessed by an Apex Shredding operator or a selected employee from your organization designated to hold a key. Our trained shredding professionals regularly collect the contents of your containers and shred everything onsite while you watch. We provide a Certificate of Destruction every time your documents are shredded to ensure your compliance. To learn more about our onsite mobile shredding services, please contact us by phone or complete the form on this page. 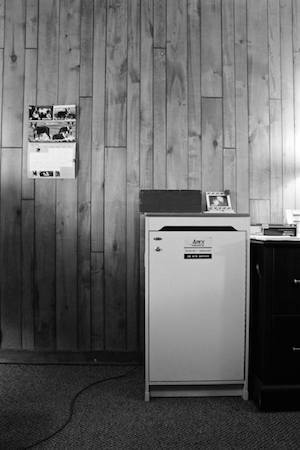 When it comes to document disposal, every business is different. We offer a customized document destruction solution tailored to your unique needs and requirements. Our scheduled shredding service offers routine, secure destruction of your files and sensitive paperwork. If you need infrequent, bulk disposal of accumulated records, our one-time shred service helps you purge them quickly and securely. Whether you shred with us weekly, bi-weekly, monthly, or up to a 12-week rotation, we bring HIPAA, FACTA, SOX, and GLB-compliant document destruction to your doorstep. With Apex Shredding, you get a privacy protection solution that offers unparalleled security and meets state and federal privacy regulations. From our headquarters in Berthoud, we provide scheduled mobile shredding services to clients in Boulder, Fort Collins, Loveland, Longmont, Louisville, Lafayette, Broomfield, Greeley, Frederick, Firestone, Johnstown, Sterling, Brush and Fort Morgan in the Northern Colorado area. For more information about our onsite mobile shredding services or to receive a free quote, please contact us by phone or complete the form on this page.